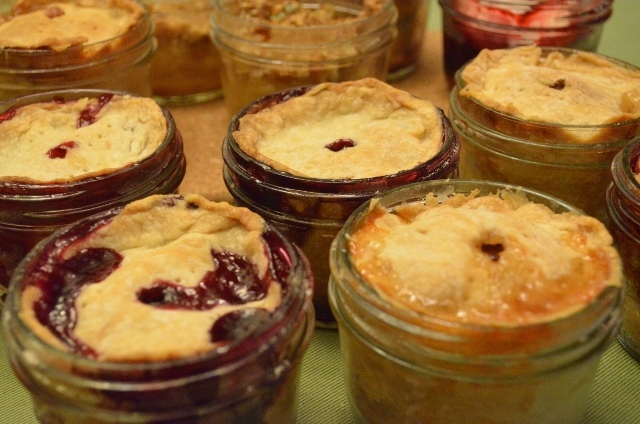 I first heard about baking pies in canning jars through a blog post from my local orchard. With a freezer full of summer fruit picking, and some empty jelly jars, I decided to give it a try. I searched online for additional information and found great directions at Our Best Bites. 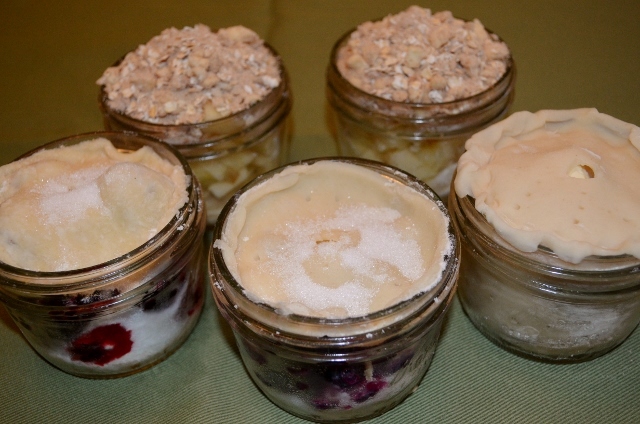 I headed to the kitchen armed with directions, jars and fruit and here are the results. Use canning jars – they are tempered to withstand the heat. I used 8 ounce Kerr jelly jars which have straight sides. 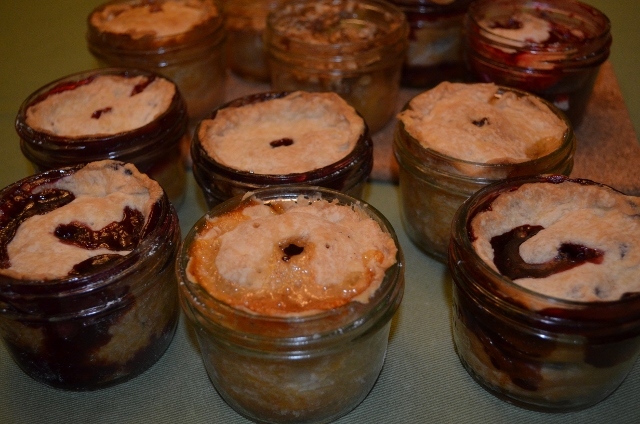 Next time I will make some mini-pies using the 4 ounce Ball jars – as soon as we finish the jelly currently in the jars. Make your own pie crust or buy a refrigerated crust (My standard pie crust recipe below). You do not have to use crust. You can just do a crumb topping (recipe below). 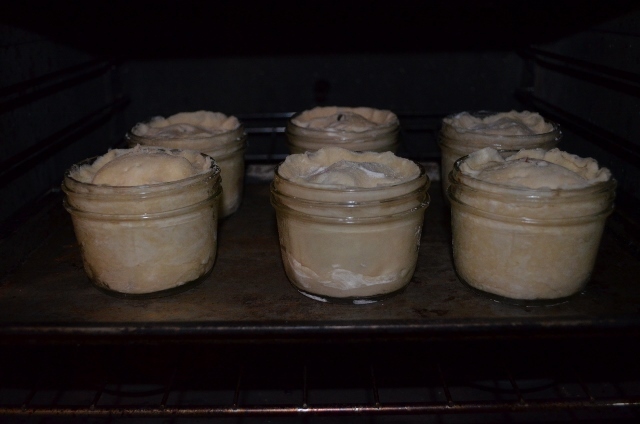 I also used crust on the bottom and top of some jars and skipped the crust on the sides of the jar. 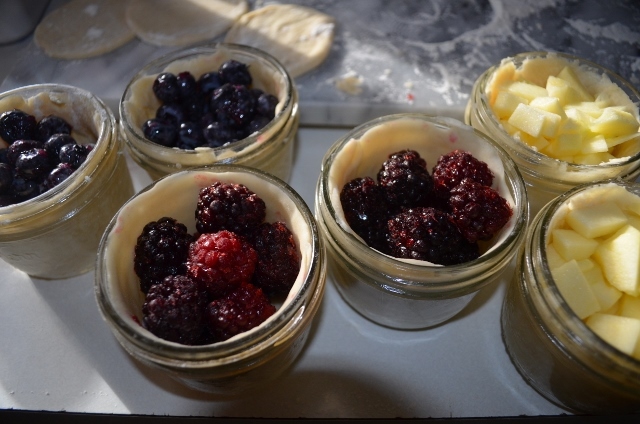 Or you can go cobbler style and layer the crust and berries. I used fruit I picked this summer – blackberries and blueberries plus some of the local apples. Wish I had some sour cherries! According to the Our Best Bites site, the pies are easy to freeze and cook later. After you put the fruit in the jar and add the top circle of dough, screw the jar lids on and they are ready for the freezer. When you are ready to cook, just take them out of freezer, remove lids allow to sit at room temperature for a brief period of time and then place in cold oven to bake. 1. Roll out the pie crust. Use the jar screw lid to cut circles which will go on the top. 2. 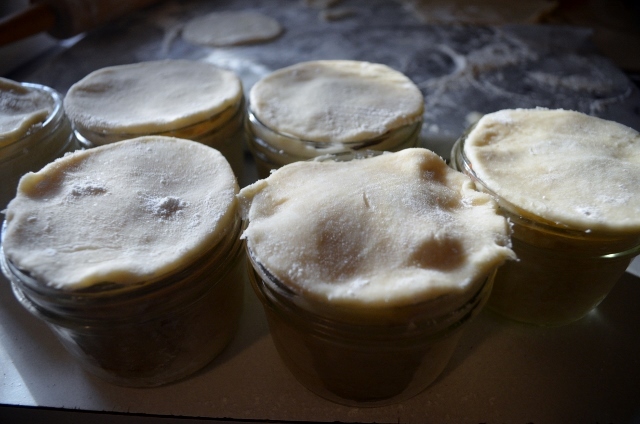 Use bits of pie dough to line the jars. 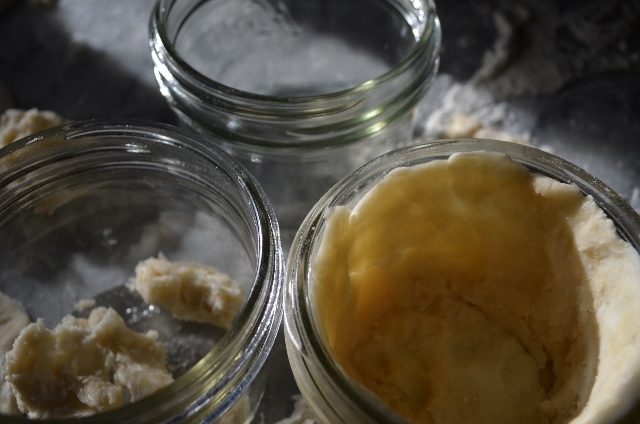 You do not need to grease the jars. 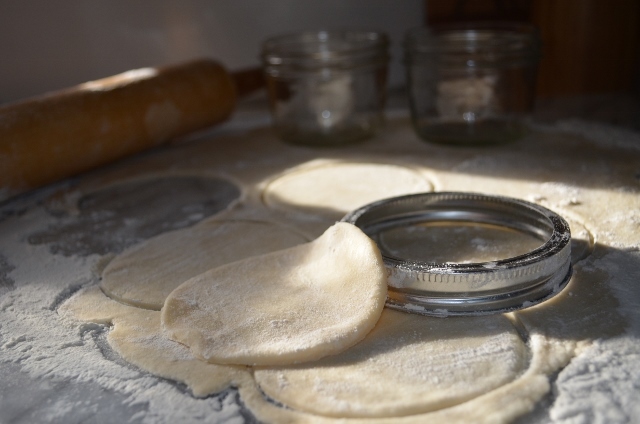 Use your fingers to press the dough on the bottom and sides of jars. 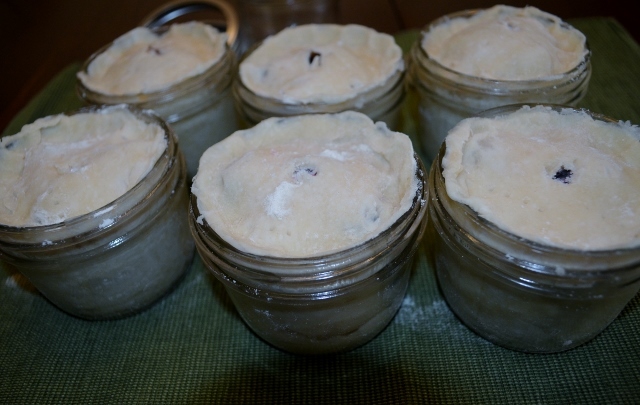 I found it was easy to cut strips of dough for the sides of the jar. 3. Fill the lined jar with favorite fruit. 4. 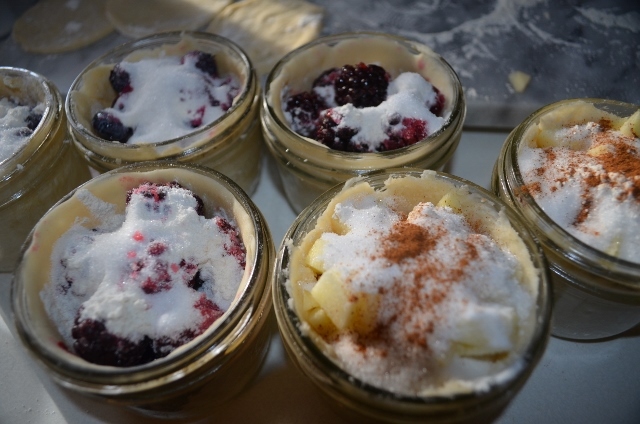 Depending on personal tastes and how sweet you like you pie and how much juice is in the fruit you are using, add 1 tablespoon of flour to each jar, approximately 2 tablespoons of sugar, and a small dab of butter. For the apple jars, I also sprinkled cinnamon on top. 6. Press the top to seal with the sides and cut a steam hole in top of pie crust. Or use variations of crust and crumb topping – crust on just top and bottom; crust on bottom crumb topping on top, etc. I sprinkled some additional sugar on the top crust of some of the jars. 7. They are ready for the oven. Place on a cookie sheet and put in a cold oven. Turn oven on to 375 and bake for approximately 45 minutes. 8. Cool on a wire rack. You can either eat the pie from the jar or remove the pie from the jar and place on a plate. Yum! Mix together brown sugar, flour, and cinnamon. Using a pastry blender, cut the butter into the dry mixture. Add oats and stir. 1. Mix sifted, measured flour with salt. Add shortening and cut into flour mixture using a pastry blender until the mixture is the size of small peas. 2. Sprinkle 4 or 5 tablespoons of water over the mixture and mix lightly with a fork. Add more water until all of mixture is moistened. 3. Gather up with fingers and form into a ball and flatten. Roll on a lightly floured surface until about 1/8 inch thick. You are welcome.They were fun to make and taste good! These look so delicious! I’d love to have one for desert! Thanks, they were fun to make and are very tasty! Thanks, Eating a blueberry one right now – good. Plan to do it again using 4 ounce jars and try freezing for later. Enjoy!